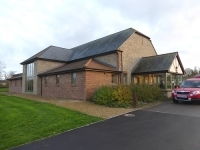 Set in the centre of the village, with ample parking and landscaped grounds, Leigh’s New Village Hall is an ideal venue for every type of function. Use of wifi subject to extra charge, but only for heavy use. Toilets near the lobby for men, women and for disabled users. Baby changing facilities. Toilet near the stage for performers and for top table guests.